Protests against a Vietnamese officials statement about the historical ownership of Kampuchea Krom – what is now Southern Vietnam – continued into a third day on Monday, as members of various groups allied against the Vietnamese presence in Cambodia gathered outside the Vietnamese Embassy on Monivong Boulevard. By my estimation, around 100 people were at the Embassy by 11:00 AM, and I was told that other activists had convened at the French Embassy and at the National Assembly – I’d appreciate it if someone could verify that for me. 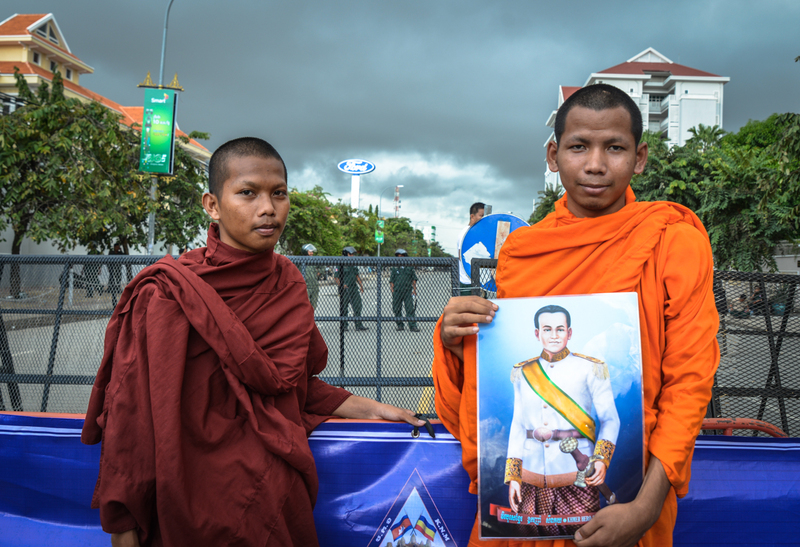 Monks pose with an image of Kampuchea Krom hero Son Kuy. Many monks had turned out to support the nationalist cause, and they had brought sundry burnable items with them. 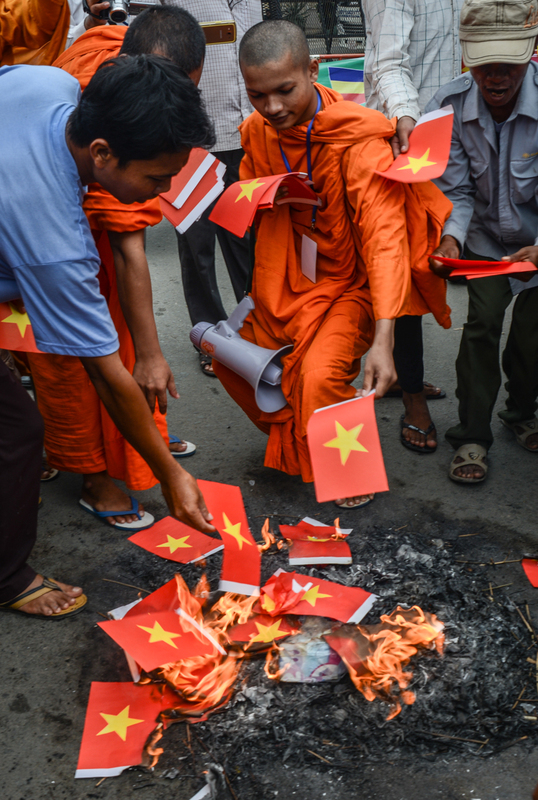 First to go was a flag, set ablaze to shouts denigrating the “Youn,” a term for the Vietnamese many feel is pejorative. 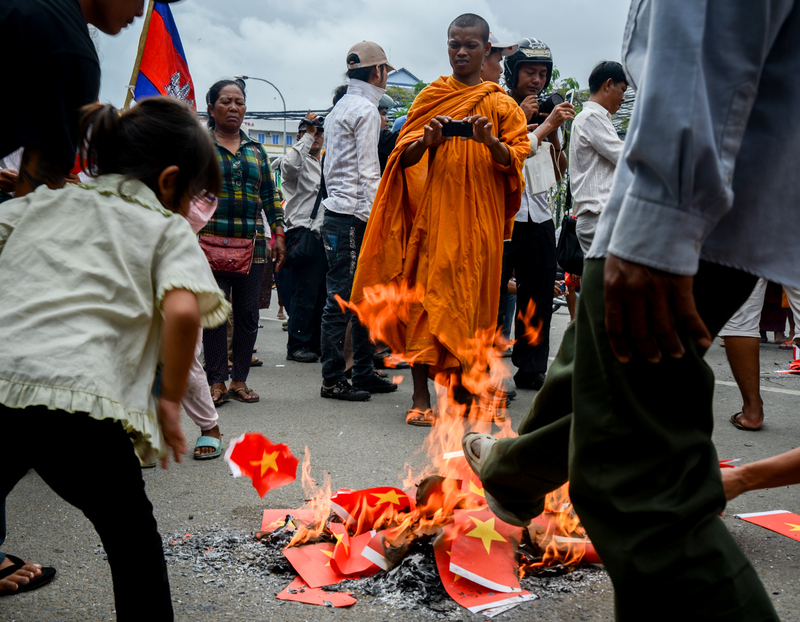 (One of the monks told the Phnom Penh Post that the flag burning, while effectively symbolic, was also rather expensive). People smiled and laughed as the flag burned, snapping photos with their mobile phones and tablets. 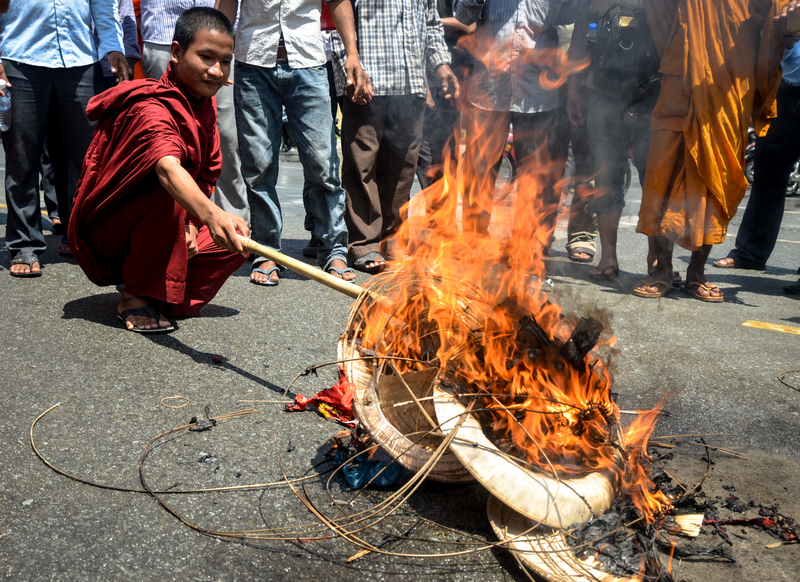 The monks added a rather showman-like element to the burnings, posing dramatically for the cameras, and shouting their complaints about the Vietnamese and their spokesman’s statements about Kampuchea Krom into a large white microphone. As the day wore on – punctuated with occasionally bouts of heavy rain – the monks brought out a sheaf of conical hats, meant to represent Vietnam, and proceeded to write upon then destroy them. “This blood is black blood” read the hats, which were alternately sat upon, spat on, and crushed beneath the sandaled, sticker-adorned feet of the activists present. 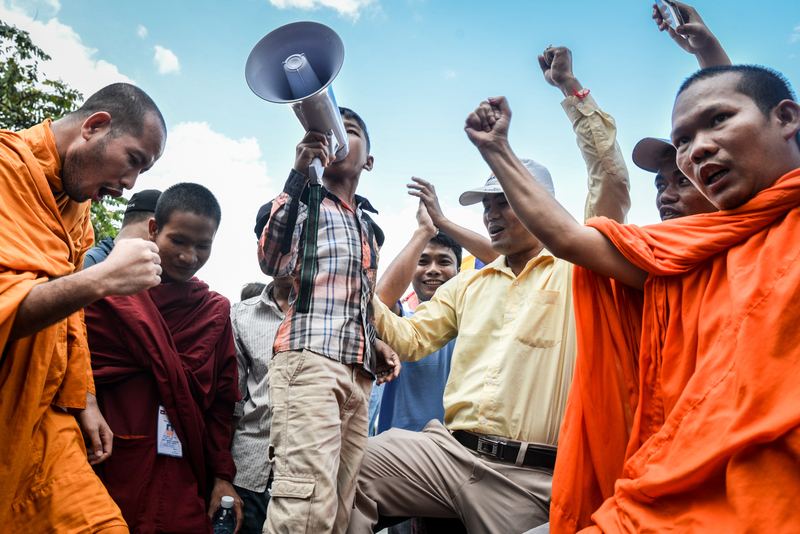 A young boy shouts his anger at the Vietnamese into a loudspeaker. I chatted with a few of the activists who were present there, including 26-year-old aluminum factory worker Rakin Sok, who told me he works in South Korea and recently returned to participate in the protests. 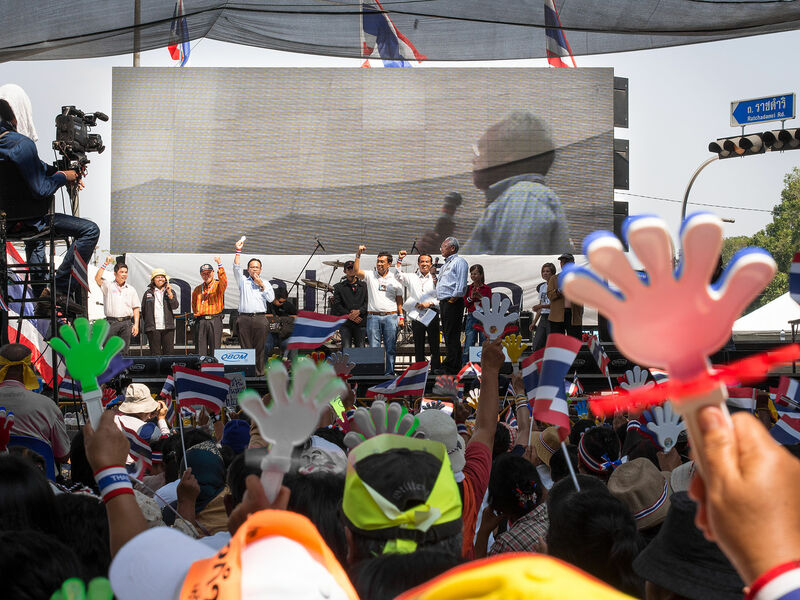 “Cambodia is not a free country – it’s Communist like Iran or China,” he said, noting that the government prioritizes benefits for foreigners (such as the Vietnamese) over those doled out to its own people. 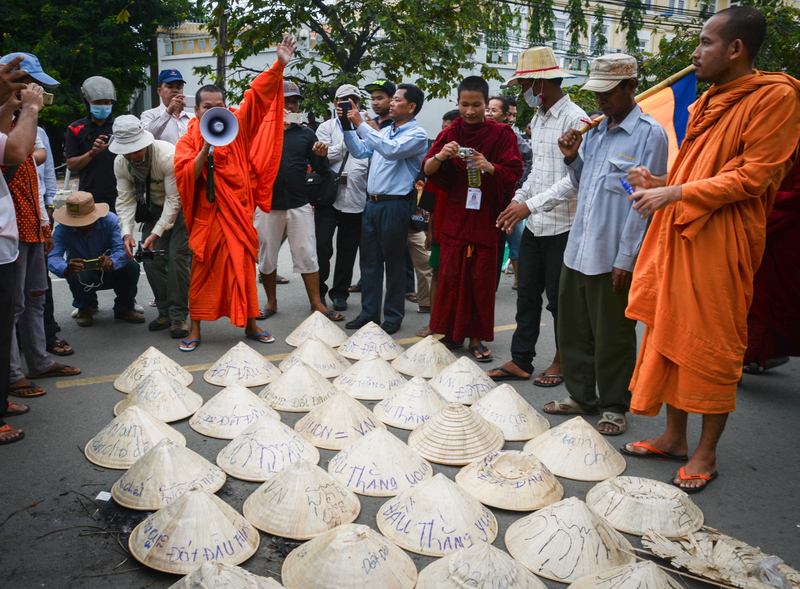 Stamping upon a conical hat, a serious insult in Khmer culture. There is, perhaps, some precedent here: in 2003, the Thai Embassy in Cambodia was sacked and partially burned, after a Khmer newspaper claimed that a Thai actress said Angkor Wat historically belonged to Thailand. Nuon told me that there are “now around 4 million Vietnamese” illegally living in Cambodia, and expressed his desire that the opposition Cambodia National Rescue Party take power in the next national election. “I hope some future new government will send them back to their country,” he said. Chantou, a 29-year-old local government volunteer for the Chankarmon district, claimed that the Vietnamese largely control the ruling Cambodian People’s Party and by proxy, Prime Minister Hun Sen. “Ho Chi Minh always tried to drive away the government of Vietnam, to get Cambodia to belong to Vietnam,” he said. Monk tending a conical hat bonfire. Preparing to stomp on hats. Chhuna lamented that his neighborhood along the Tonle Sap in Phnom Penh was being taken over by the Vietnamese, but said he would be willing to accept a small number of Vietnamese immigrants if they arrived legally. 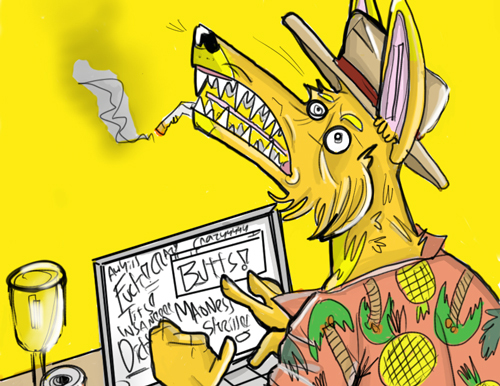 What does he think of these protest tactics? 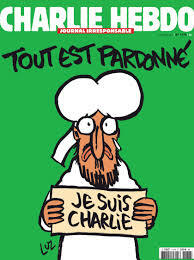 “It could become a violent demonstration,” he told me. “Are you OK with violence?” I asked him. “Maybe,” he said, with a thoughtful look. 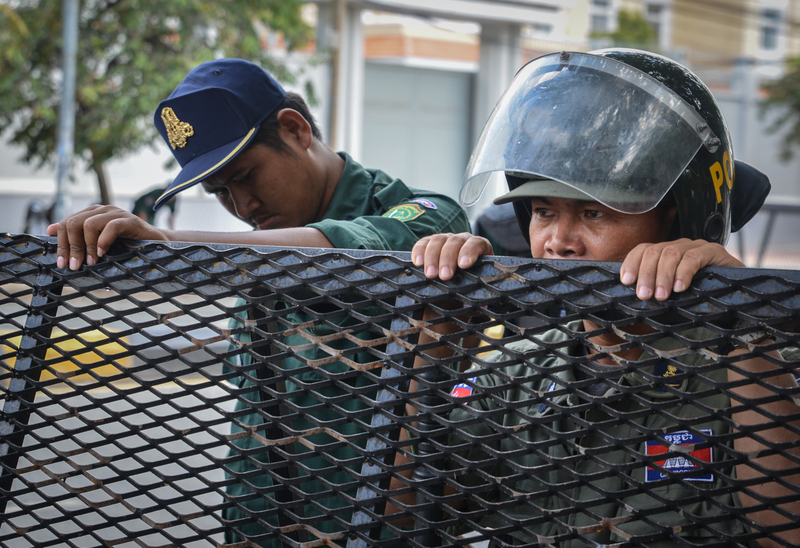 It’s over: Thai prime minister Yingluck Shinawatra has finally been ousted by a Thai court after a contentious and occasionally bloody political standoff that has dragged on since last summer. In office since the summer of 2011, Shinawatra rode the Thai political tiger for as long as she could — but was eventually brought down by allegations that she transferred a bureaucrat illegally for her own political ends. Yingluck is now the latest political casualty in the ongoing battle between “red shirt” supporters of the Pheu Thai party and her exiled brother, former prime minister Thaksin Shinawatra, and the “yellow shirts,” who largely are composed of Bangkok residents and wealthier, urban Thais. Already removed from power, her troubles don’t end there: she was indicted by Thailand’s anti-graft body over a rice subsidy scheme, and may be impeached by the Senate if found guilty.